In this next installment of the new play-your-way adventure tale, players encounter a haunted arcade on a deserted boardwalk. Upon entering, the reader finds themself absorbed into one of two video games in which the reader determines the course of action, ultimately controlling whether they live . . . or die! During a late-night stroll on your boring summer beach vacation, you discover a derelict video arcade managed by a ghostly attendant. 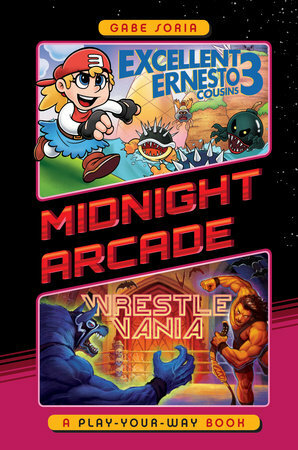 Presented with a magical game token, you select one of two games you wish to play, the Excellent Ernesto Cousins 3 or Wrestlevania. Once you place the token in the slot, you have to make choices to advance through the games, and your decisions control whether you beat the game--or die. Both games feature unique challenges and life-like game play that will delight readers, and the most important choice in either game for those now trapped inside them, is the one that will keep them alive.